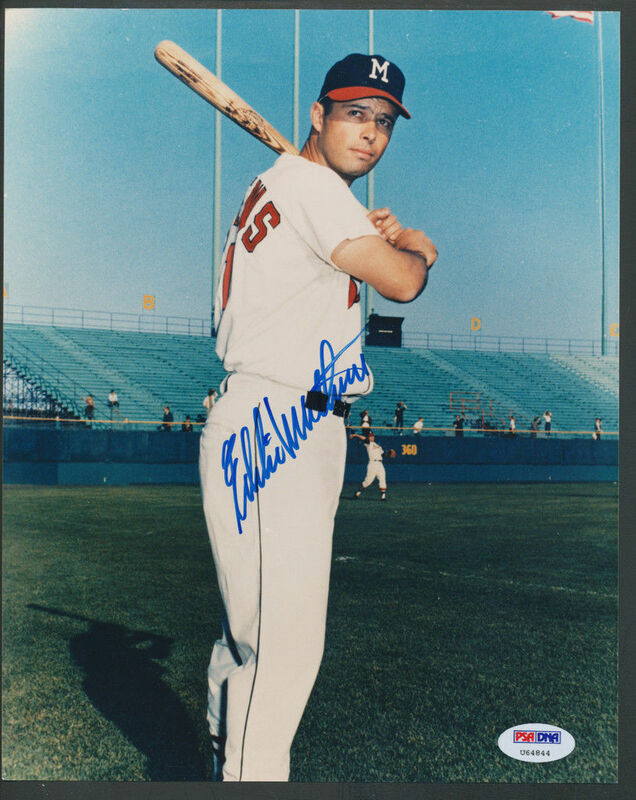 As a member of the 500 Home Run Club, Eddie Mathews baseball cards and autographed memorabilia have always been cherished collectibles. His rookie card comes from the legendary 1952 Topps Baseball. 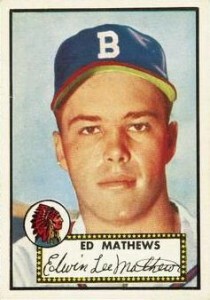 Eddie Mathews is considered to be one of the best third basemen of all-time. He was inducted into the Baseball Hall of Fame in 1978. Mathews shunned the spotlight and was not a regular member of the post-retirement autograph circuit that would establish itself in the sports collectible market years later. As a result, his autographed items command a premium with high-grade examples often being difficult to find, particularly, jerseys. He did live long enough to see the inclusion of retired players in modern trading card products. 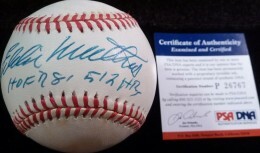 As a result, he does have several on-card autographs in products released between 1997 and 2000. The colorized portraits of the 1952 Topps Baseball set produced some of the most iconic baseball cards of all time. 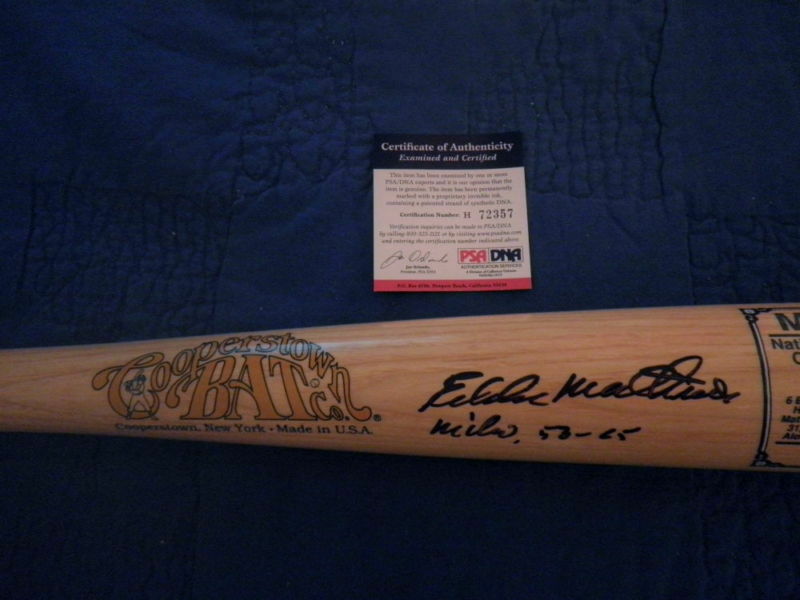 Eddie Mathews' ranks right up their as one of the best. Featuring a large head and shoulders photograph, the card also displays the Boston Braves logo along with his name and facsimile signature. The final card in the set, it's extremely tough to find. As a result it commands a higher premium than one might already expect. 1962 Topps #30 MILWAUKEE BRAVES SLUGGING 3RD BASEMAN THE GREAT EDDIE MATHEWS!!! 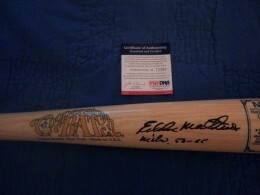 Below you will find an example of what Eddie Mathews's authentic signature looks like. This can be used as a first point of reference for determining the legitimacy of autograph memorabilia, but is not a substitute for having your items authenticated by a well-respected professional autograph authentication company. Some of the trusted sources within the sports memorabilia market include the following companies: PSA, JSA, Steiner, Mounted Memories and Tristar. Click on any of the images below to view full size photos. Close inspection shows that all the letters are discernible. The "E" is formed in a manner, that despite it being printed, the pen remains on the paper as it connects with the first "d"; it does this with two small vertical lines, coming off the second and third horizontal lines. The loops of the "d"'s are open with the second often having a curl coming off the top of the vertical stroke. The "i" is dotted but is combine with the "e" and as such results in looking more like a letter "a." The "M" has angular humps with each one visible. The letter "a" is slightly open. The cross of the "t" also crosses the "h."
The "e-w" are expressed but the hardest to discern and the "s" is legible.